The demise of the traditional slasher film in the late '80s didn't mean the end of movies about rampaging killers; filmmakers just had to get more creative. In place of knife-wielding maniacs, moviegoers could instead enjoy the antics of surprise fan favorite Chucky in the successful Child's Play and its sequels, or the not-so-successful Horace Pinker in Shocker, both involving serial killers apprehended by the police and using their demises to continue their rampage and get revenge. 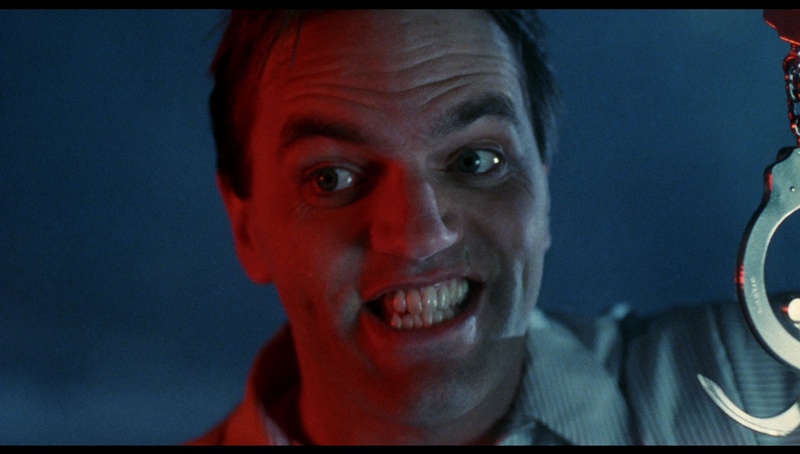 That formula turned out to be surprisingly durable, even fueling the plot of Peter Jackson's The Frighteners, but none were as knowingly ridiculous as Jack Frost, which takes the combination of extravagant murder sequences and corny one-liners to an extreme bordering on performance art. While being transported from a penitentiary to his date with the electric chair, notorious psycho Jack Frost (MacDonald) is accidentally set free when the prison vehicle collides with a big truck hauling scientific chemical material (the true nature of which we don't find out until later). 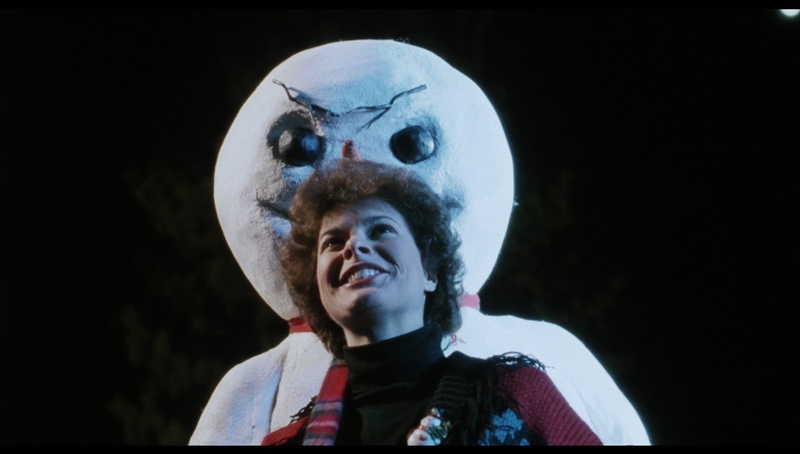 Jack ends up getting doused with a heavy spray of chemicals and melts on the spot into a bloody glop into the snow, which merges with his molecules and results in... a big killer snowman. 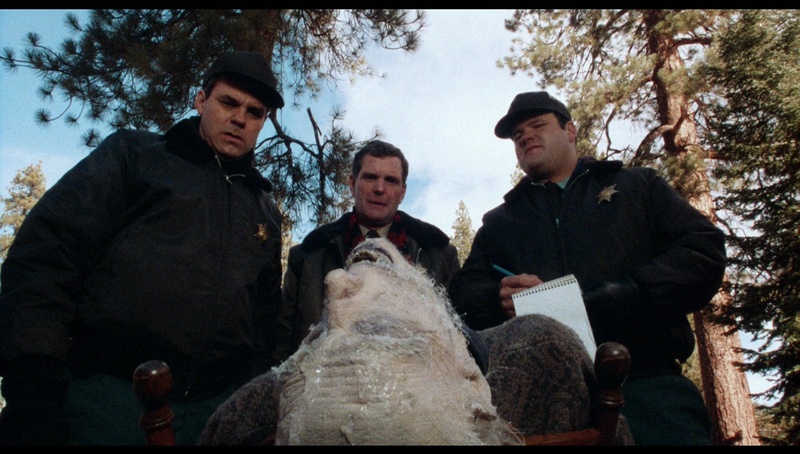 Meanwhile Sam (Allport), the sheriff responsible for catching Jack during a random stop along the road, is haunted by Jack's threat to kill not only Sam but his entire town, Snowmanton (yes, really). Soon nasty murders start claiming the townspeople via everything from a sled to Christmas ornaments, so two FBI agents (Mendel and LaBelle) are sent in to get to the bottom of the icy mystery. A basic synopsis can't quite do justice to the lunacy of Jack Frost, which trots out so many Christmas gags you can't even keep count after the first 20 minutes or so. 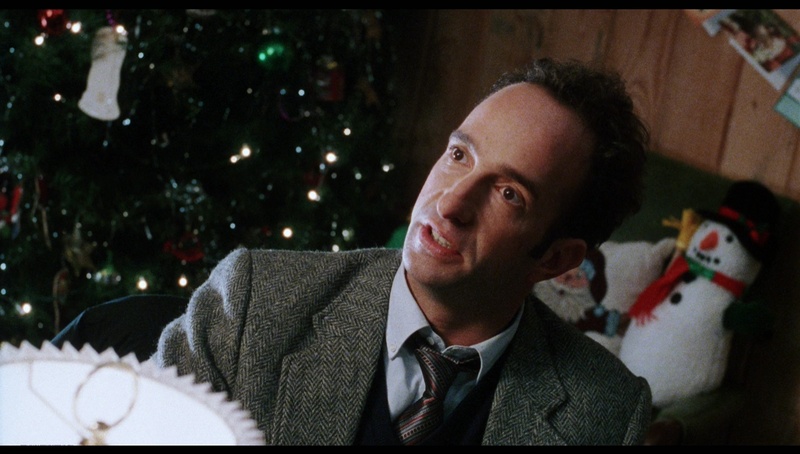 Not to be confused with the later Michael Keaton film of the same time (which is actually more unsettling since it's about a dead dad coming back to help his wife and kid as a possessed snowman), this is a yuletide horror film unlike any other with a fiercely committed performance by MacDonald easily holding it together. It's also notable among '90s movie fans for an appearance by a very young Shannon Elizabeth, who gets the most disturbing scene when she encounters Jack Frost in a bathtub and suffers a fate that wouldn't look out of place in SuperVixens. 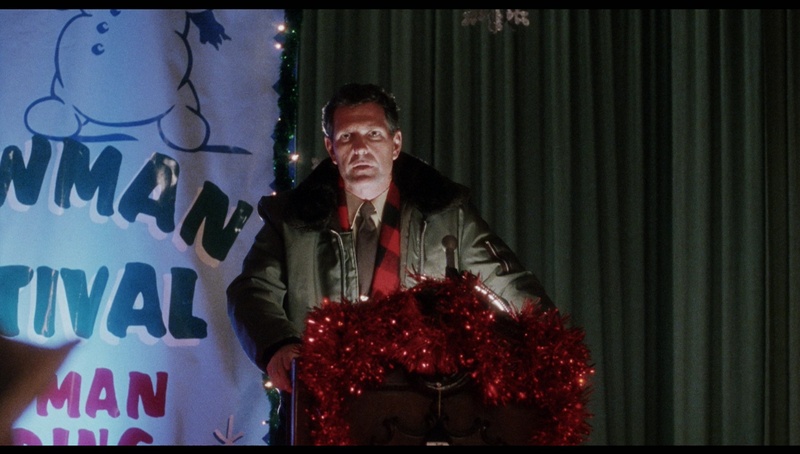 The combination of brutal violence and yukity-yuk one liners isn't something that will necessarily appeal to everybody, but if you're on the right wavelength, it's a pretty wild sleigh ride. Jack Frost was shot very cheaply on short ends in 1997 but didn't get much exposure until Simitar issued a VHS in 1998 (with a simultaneous laserdisc from Image Entertainment), followed by a cheapie DVD soon after. 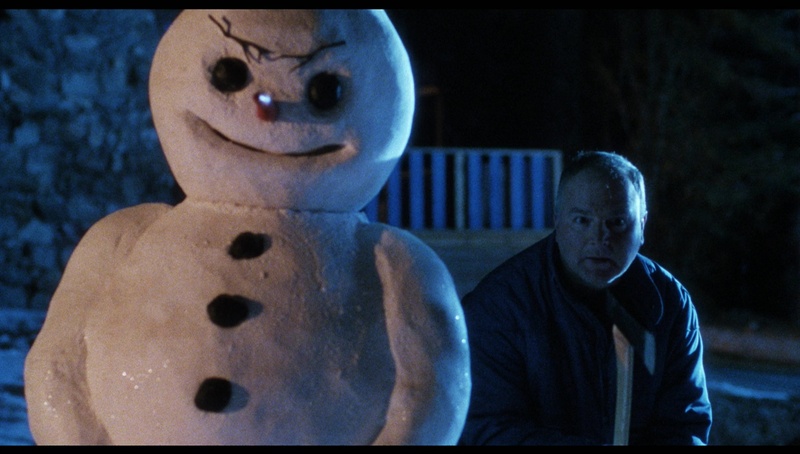 (MacDonald and writer-director Michael Cooney reunited in 2000 as well for a sequel, Jack Frost 2: Revenge of the Mutant Killer Snowman.) Anyone who's seen a transfer from Simitar knows it was no great shakes, though it was a bit more colorful and generally watchable than most of their output. The fan garnered a bit of a rowdy fan base over the years, turning into something of a Christmas party fan, which means the time was ripe for a special edition. That's exactly what you get with Vinegar Syndrome's 2016 dual-format Blu-ray and DVD edition, also issued as a limited edition lenticular cover for Black Friday featuring a cool morphing Jack Frost face. The new 2K transfer looks very impressive, featuring richer black levels that really make the film pop more with very strong, Christmas-themed colors throughout and nice, pure whites; it's hard to imagine how this could look any better. The 1.85:1 framing is also a bit better balanced compared to the older releases, adding slivers of extra info on the sides while shearing off a bit of extraneous areas from the top and bottom. Audio can be played via a lively DTS-HD MA 5.1 English track or the more traditional 2.0 stereo one (with optional English subtitles), plus a cheerful new audio commentary with Cooney (moderated by Elijah Drenner), who talks about being inspired with friend Jeremy Paige by a real-life snowman they build outside a cabin, the state of the direct-to-video horror movement, the original intention for a bigger effects-driven production with the involvement of Renny Harlin (which Geena Davis purportedly nixed), the evolution of Jack from a morphing water creature to a full-time snowman, how the casting of MacDonald dictated the direction of embracing the film's humor, the difficulty of shooting the bathtub scene, and plenty more. In addition to a brief Cooney video intro, you get a pair of new video extras starting with an energetic, very funny 16-minute "Happy Scary" interview with MacDonald, who talks about going way over the top on purpose in his performance, the devoted local fans he's run into over the years, and some of his other effects-heavy roles including a stint on The X-Files. In "Shooting Frost," cinematographer Dean Lent gets a 6-minute video interview about how he got into the business with Allison Anders (on Border Radio and Gas Food Lodging) and faced a big challenge shooting this in Big Bear, California without any real snow in sight, resulting in a great stoner dorm movie as well as one of the craziest Christmas horror movies of all time. Reviewed on November 25, 2016.